Is This Selloff About To Turn Into An Avalanche? 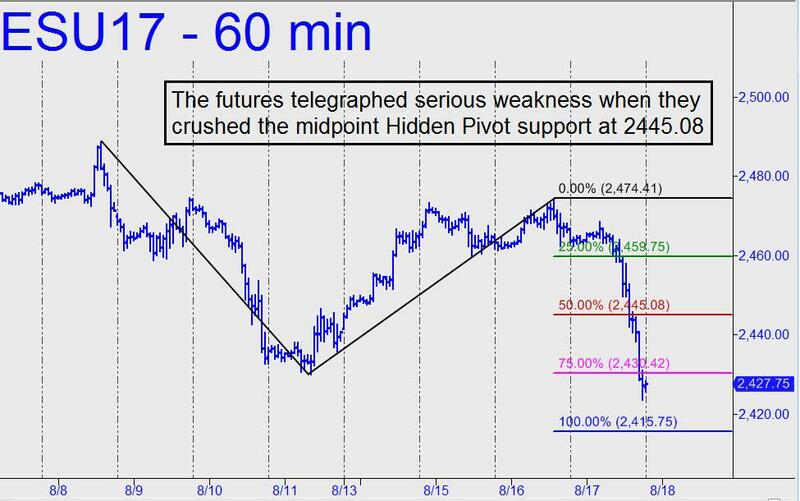 At Thursday’s close, the futures looked likely to achieve a 2415.75 downside target that I posted in the chat room at 13:27, when this vehicle was trading 30 points higher. The target, a Hidden Pivot support of middling importance, is sufficiently clear and compelling that we should expect to see a tradeable bounce from it. However, if the selloff is going to prove to be the start of something much worse, then the September contract should slice through the pivot as though it were not there. Let’s see how it goes before we rush to judgment. Regardless, subscribers who were short for the ride down based on my guidance can try bottom-fishing at 2416.00 with a five tick stop-loss. You’ll be on your own if the order fills and goes in-the-black.